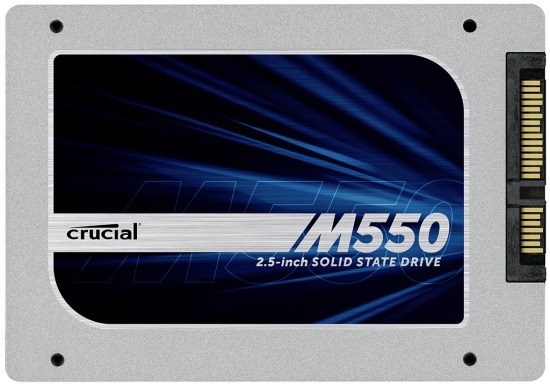 Crucial rolls out the M550 series of solid state disks. Available in 7mm 2.5" SATA as well as mSATA and M.2 form factors, the new M550 series offers higher transfer rates and a couple of new features like NWA (native write acceleration), RAIN (redundant array of independent NAND), adaptive thermal protection (ATP), and hardware encryption. On top of that, the M550 series is also cheaper per gigabyte than the current M500 series. The drives appear to be based on a Marvell-made controller platform, with Micron-made MLC NAND flash. The mSATA 6 Gb/s and M.2 models come in capacities of 128 GB, 256 GB, and 512 GB; while the 2.5-inch SATA 6 Gb/s models include 1 TB capacity. The drives offer sequential reads as high as 550 MB/s, with up to 500 MB/s of sequential writes. They're backed by 3-year warranties, and should eventually replace the M500 series from their existing price points.